Puebla is a modern and highly industrialized city, while also being one of the most authentic and traditional places in Mexico. The main attractions are located in the city’s gorgeous historic downtown area; here the colonial buildings showcase some of the purist examples of 17th and 18th century baroque architecture. During your time in this magical destination you can find lots of museums, more than 70 churches, convents and sanctuaries, and incredible buildings, such as the city's imposing Cathedral, which is over 207 feet high, and the region’s stunning archeological sites. A visit to Puebla also allows you to taste some of the most famous local cuisine in Mexico, rich in aromas and flavor. The “poblana” cuisine provides a perfect blend of pre-Hispanic and Hispanic cultures, creating delicious dishes such as “chiles en nogada” and “mole poblano”, as well as exotic sweets and candies. 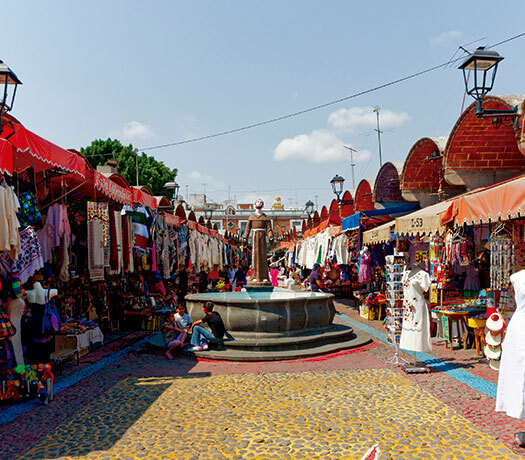 Puebla’s handicrafts are also very unique; here you can acquire refined Talavera pottery, beautiful onyx items and textiles. Another of the main attractions in Puebla is the Cholula Pyramid, which is considered to be one of the biggest monuments in the world and features 5 miles of tunnels for you to explore. If you are looking for adventure and you like to get close to nature, don’t pass up the chance to visit the impressive Popocatepetl-Iztacihuatl National Park. 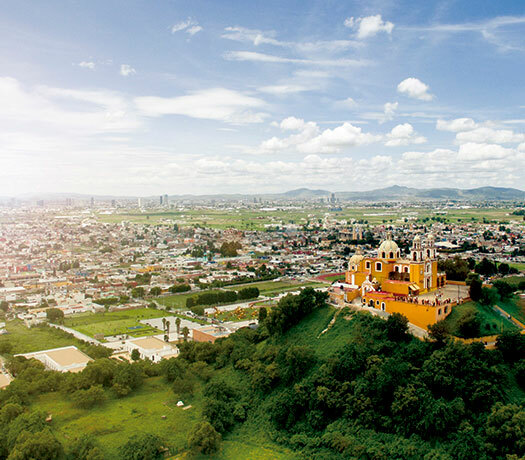 All in all, Puebla is a vibrant architectural jewel in Mexico’s crown, offering sophisticated modern buildings complemented by the breathtaking beauty of vestiges of colonial Mexico. Puebla’s colonial architecture, cuisine and handicrafts combine with its first class hotels, shopping malls and excellent meeting and convention facilities to make it a perfect destination for business travelers, as well as for people looking for a culture-filled vacation. 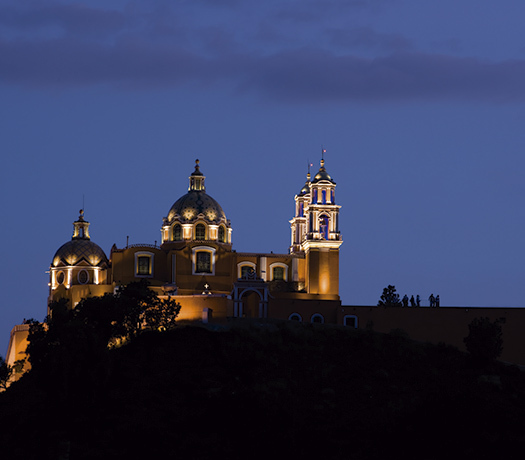 Puebla has consolidated itself as a pillar in Mexico’s business, groups and conventions tourism industry thanks to its geographical location, its facilities, and its cuisine. It offers more than 8,000 business category hotel rooms of 4 stars or more, as well as first class facilities that include Puebla Convention Center and the UAP’s University Cultural Complex, whose outdoor esplanade can accommodate up to 15,000 people, as well as 3,500 attendees in its auditorium.